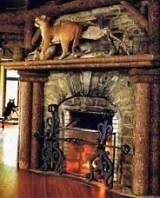 The Corner Gas Fireplace . 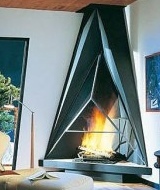 . . A Great Way To Maximize Your Space! 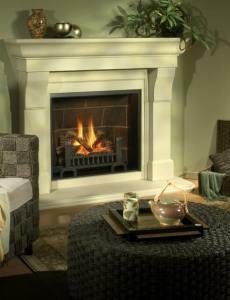 A corner gas fireplace is a great way to maximize the use of limited interior space. Not only can it be sized to fit into rather cramped quarters, but it affords a great deal of flexibility in furniture arrangement . 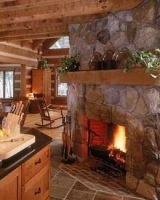 . . . . . . AND a great view of the fire from virtually anywhere in the room! 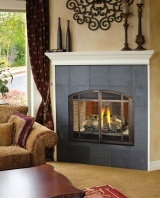 If space is at a premium, the two vented gas models that follow may provide a solution. Specifically created for tight spaces, the portrait style design pictured below, left, is from Lopi. 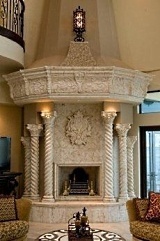 Nestled in a corner cabinet from J.C. Huffman Cabinetry, it takes up a minimal amount of interior room. This charming design may be placed at floor level or elevated (as shown here), making it ideal for small intimate settings such as bedrooms, baths, dens, and kitchens. 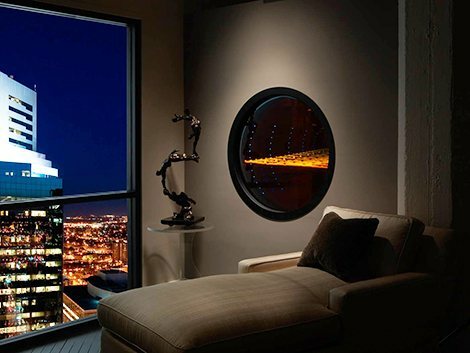 Starkly contrasting in style is the sleek contemporary design pictured below, right, from Dutch manufacturer Drugasar (DRU). 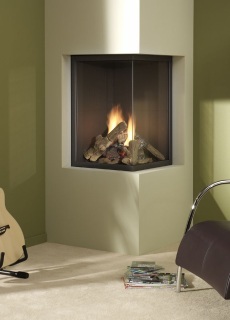 Distinctive, versatile and energy-efficient, DRU's "Paco" corner fire offers an expansive multi-sided view while providing a minimalist look in a minimal amount of space. 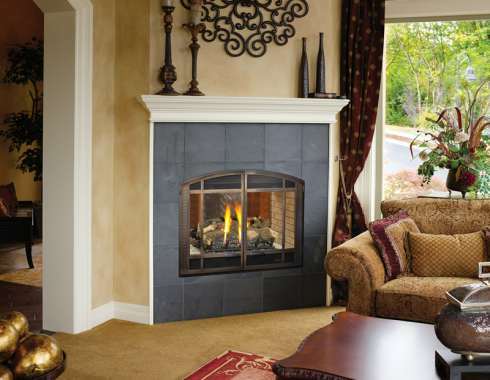 If you have a little more space to spare, a wall can be built at a 45 degree angle across the corner to accommodate a Valor Ventana fireplace. 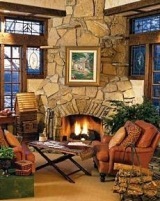 Designed to produce radiant heat and efficiently reduce heat loss -- and energy costs -- the versatile Ventana is "comfortable" in a variety of settings, as shown below. 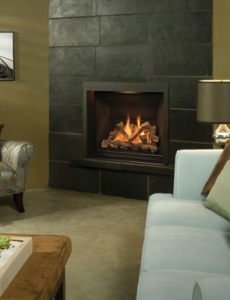 With no visible vents or louvers, it simulates the look of a real masonry fireplace. 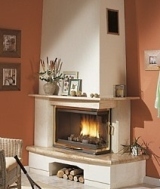 Available in a wide range of both traditional and contemporary styles, the corner hearth is offered in an array of regional variations, as well. 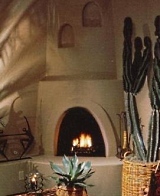 For example, the distinctive beehive-shaped kiva fireplace -- commonly found throughout the southwestern United States -- is typically positioned in a corner of the room. Echoing the ceremonial chambers of the region's ancient Native Americans, kivas are smooth and gently rounded, as shown in the following two examples from Southwest Kiva. 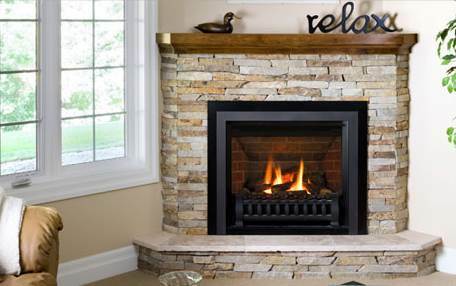 As with other types of fuel-burning fireplaces, a corner gas hearth or surround can be crafted from a wide variety of materials including . 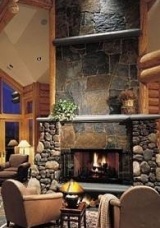 . . . .
brick and stone . . .
wood and concrete . . .
and both painted and stainless steel. Formal, Semiformal . . . or Laid-back & Casual? 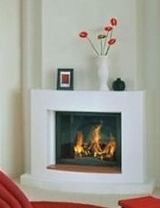 A corner fireplace surround can be created in any style for nearly every setting. 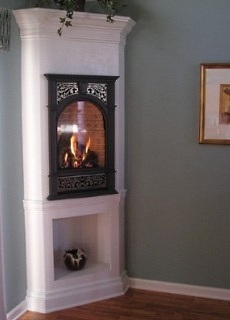 Note how the traditionally-styled mantel shelf, pictured below, helps to tie the room together. 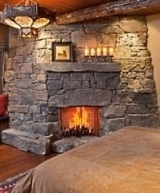 With its ledgestone surround, the design that follows has a more casual look and feel. 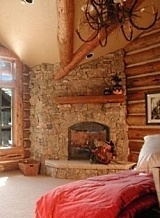 It also features a raised hearth and stained wood mantel shelf. 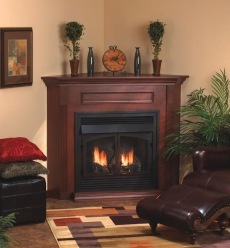 Regardless of the style of your room, you'll find a host of corner gas fireplace options from which to choose. 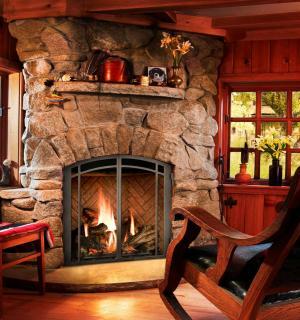 A corner hearth that not only complements your decor, but offers a viable solution for rooms that are difficult to arrange or that have a limited amount of "usable" space. 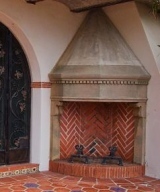 Please check back often or subscribe to our RSS feed, as we frequently add new images of corner hearth designs to our site. 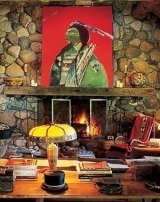 Steppin' Up & Out...Southwest Style! Ideas . . . Rock Solid!